Playing Games on a various operating system is always an excellent source of entertainment for all the ages. There are a lot of platforms (OS) which will offer you to play awesome games such as Windows PC, Linux, Xbox, and PlayStation. If you are a Linux user, you can easily play games on Linux. Linux offers a wide range of gaming system as like Native Linux Games, Browser Games, Windows Games, and Terminal Games. If you are a gamer, you will probably ask a question about how to play games on Linux. You previously knew that you could do anything on Linux like watching a movie, playing music, etc. Linux is an open-source operating system. You will see that almost all applications are free to use on Linux. You don’t need to spend money on them. Even no crack or patch is required for any apps. You can play games on Linux, but there are certain things to do if you want to play all the games on Linux. I think you will be confused about what I am saying. Let’s go to the details about gaming on Linux. In several times, I have been asked about how to play games on Linux. So I will be providing a comfortable and step by step guides on this topic. You should remember that I am not discussing gaming on Ubuntu. I am just talking about gaming on Linux at all. Which Types of Game You can Play on Linux? In Linux, you will be able o play plenty of favorite games like Counter-Strike, Metro Last Night, etc. But you will not be able to play all the latest and favorite games that available on Windows until you follow some specific Linux Hacks like using Wine or Crossover, later we will discuss all those. Because you know that Linux OS is only running on 2.5% of the world’s desktop. This figure discourages most of the game developer not to bring their games to Linux. Because, you know, profit matters. That’s why you can’t play all the games on Linux. Ops sorry, yes you can play but have to follow some tips and tricks. Moreover, many game companies spend huge money for making games, but Linux is open source OS. It provides the free application. But paid games are not free at all. So at first, we should have a look which games are available on Linux. You will generally get four types of Linux games. I am going to unfold the whole tutorial into these four segments. Now, let’s see where you will find the latest Native Games for Linux. 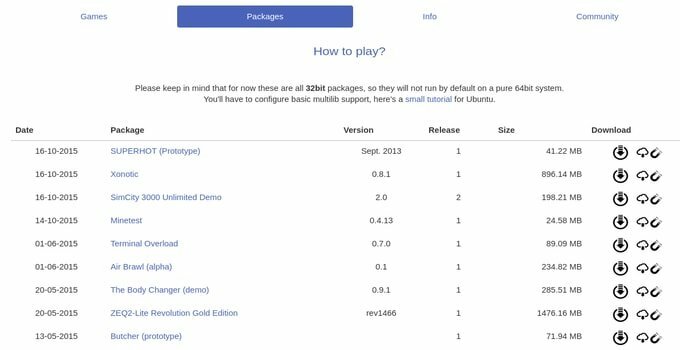 Native Linux games are officially supported on Linux. These games require default Linux Native Client. But don’t worry about it because it is pre-installed on Linux. 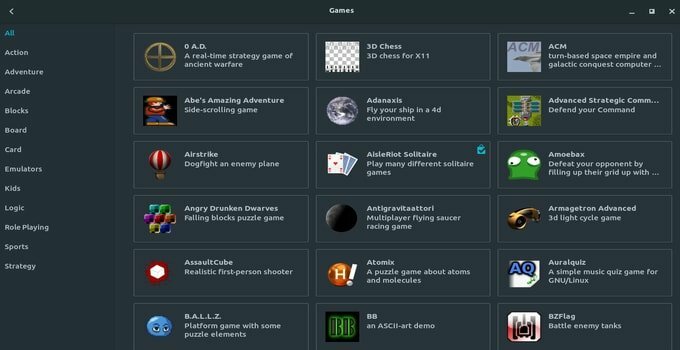 Now I am going to share all those resource hubs which offer you most of the latest and favorite games for Linux. Before going to anywhere finding the best Linux games, at first, you must go to default software repositories of the installed Linux distribution. There are hundreds of games available in the software center based on various categories. As I am using Ubuntu, software center is the place where I will be getting all those games. But for you, it may be different basing on your Linux distribution as like Linux Mint, Manjaro, Arch Linux, etc. 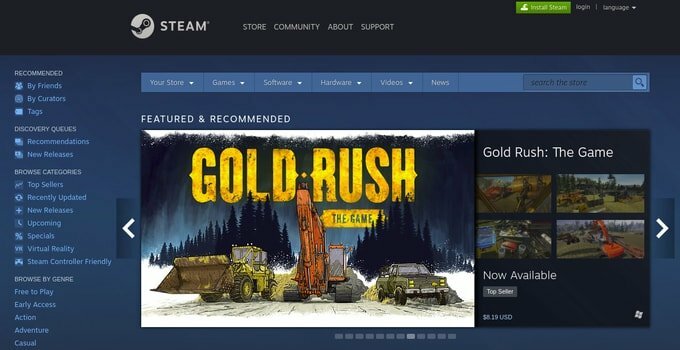 Steam is known as the most popular gaming client for Linux video games. Steam will offer you to Buy and download the latest and favorite games. These games are officially protected with DRM. GOG.com is another similar platform like steam. You can quickly browse and download thousands of games from GOG.com. You can also Purchase games and install it on your system. The purchased games will be saved in your account. GOG.com mainly features DRM free games. You don’t need to use any client app like steam to download games. 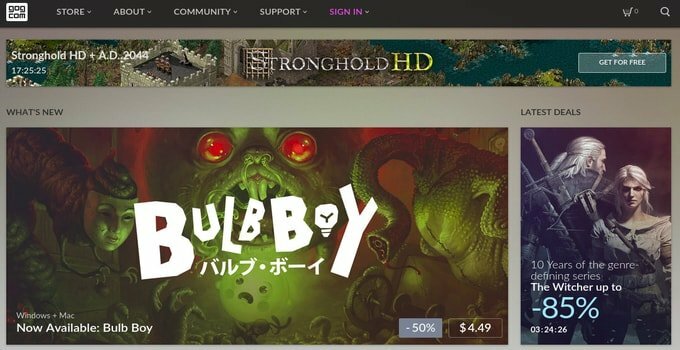 It’s a web-based gaming hub where you can buy and install it across the primary desktop environment. So it’s one account rule them all. 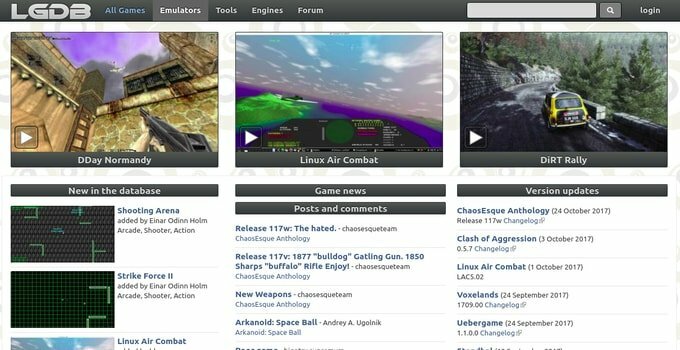 Portable Linux Games is a popular website for downloading Linux games. All the games are available for offline installation also. You download the games and keep them on your hard disk drive. Later on, double-click any of the games file and install it. These games file is essential when you don’t have any high-speed internet connection. 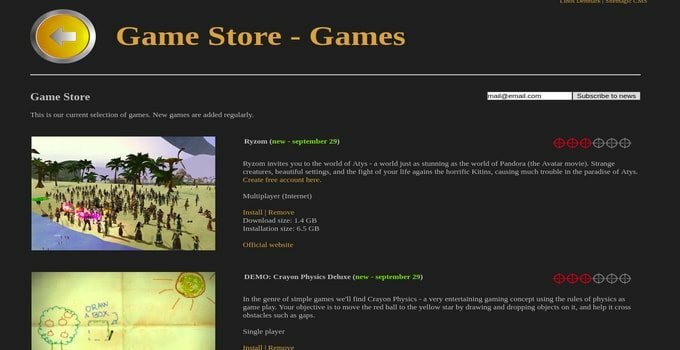 Linux Game Database is a fantastic website with a vast collection of games for Linux. You can quickly browse all the games as per categories. 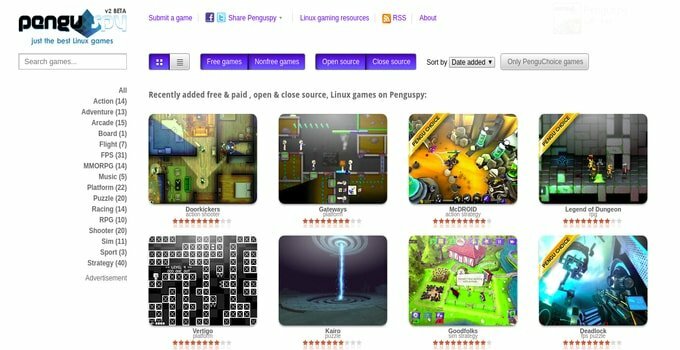 It’s a Linux games collection sites where users can rate the games like IMDb or IGN and download the games from the developer site. 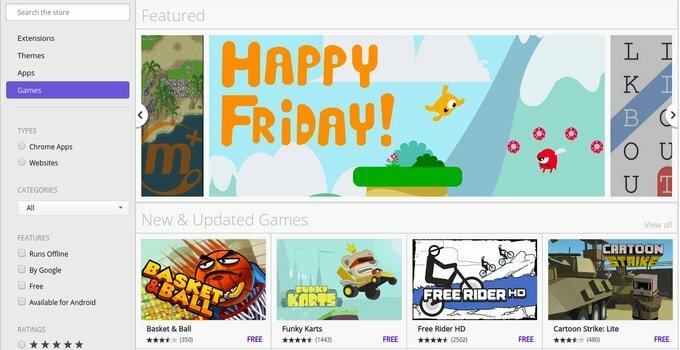 Though Game Drift is a Linux distro solely made for gaming purpose, you can always go to its game store for downloading all the latest games. Penguspy is an excellent source to download Linux based games. This portal is created for those who refused to play games on the Windows platform. You can browse the games as category-based and install it from the developer’s website. There are a lot of games not available to play on Linux. 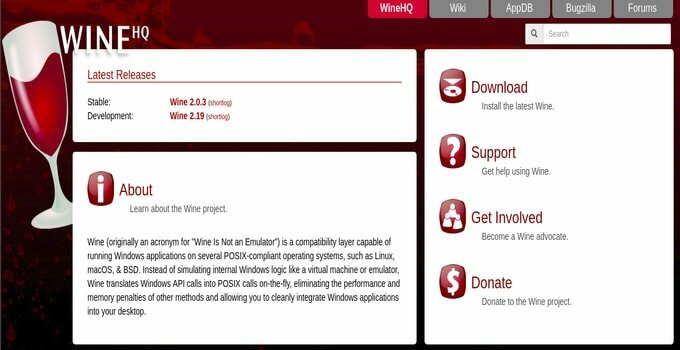 But if you install windows emulator – WineHQ, you can easily perform a lot of Windows games and applications also. You can install Wine via software center on Ubuntu or software repositories on other Linux distros. It will help you to launch windows games and apps on Linux. Moreover, WineHQ has compatible features which help you to run windows application as well as games. You must have a look on which software and games are supported by WineHQ from the official website. PlayOnLinux is also a desktop client based on WineHQ. But the overall interface is simple and more comfortable for the newbie users. This app is also free of cost as like WineHQ. You can also install it from the distros specified software center. 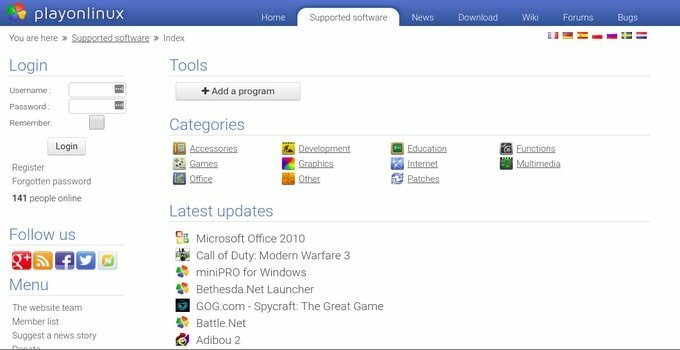 Before going to install in on your Linux system, must check the list of supported apps and games from the official website. 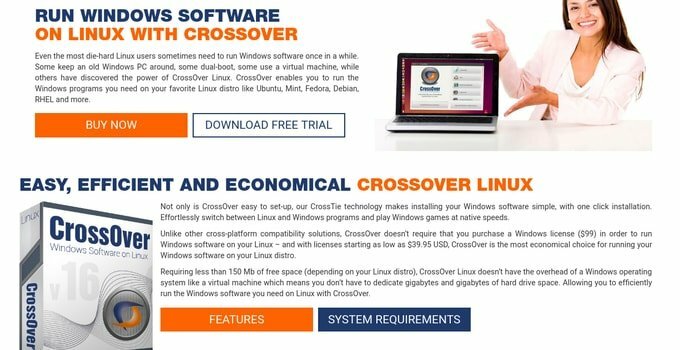 CrossOver is the best version of Wine, but it is not free. You have to purchase a license before running any games or apps on Linux. You will get a lot of support both technical and professional from the team of WineHQ that will help you play more games. You need to spend 48$ per year to use this app and support the developer team. Web Browser is a great tool to play a ton of games. It supports all OS like Windows, Linux, Mac, etc. You can play some fantastic online games from a web browser. Google Chrome is a popular web browser application that will allow you to play thousands of games from Linux. Just open your Browser and go to the extensions tab and search for games. You can easily play those games online as well as offline. Command line or “Terminal” is a great tool to play a good number of Linux games. Thought the list is not that big one, but you can easily enjoy Snake or 2048 from the Terminal. Though gaming on Linux was not easy for the newbie users, I believe now you have a good idea on how to play games on Linux after following the above tutorial. At first, it may seem a bit difficult to play games on Linux but after few days, when you accustomed, will be just fine like playing games on Windows. So don’t get puzzled, follow this tutorial and let me know what do you think about playing games on Linux in the comment section. Don’t forget to share this Linux tutorial with your friends who play games all the time.